70385 Features: Pack includes sufficient lifesaving supplies and more for family of four. Also includes: 4 survival blankets, 4 ponchos, first aid kit (107 pieces), leather work gloves, 4 goggles, 4 Noish N-95 dust masks, multifunctional tool with pliers, 12-hour emergency snap lights, emergency whistle, emergency communication plan, duct tape – 10 yards, and bio hazard bags. 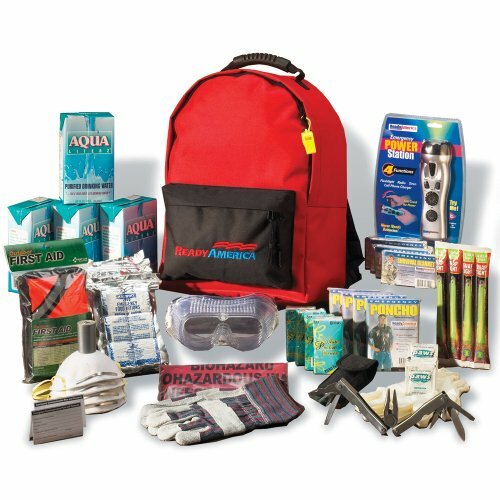 Be prepared for anything with Ready America’s 3-day Deluxe Emergency Kit. Unique to the kit are an Emergency Power Station, 10 yards of duct tape and multifunction pocket tool with pliers.